Miley Cyrus was moved to tears on “Ellen” while trying to talk about Hurricane Harvey’s destruction in Houston. The “Party in the U.S.A.” singer and Happy Hippie Foundation founder is putting her money where her quivering upper-lip is, donating $500,000 to the relief effort. “I’m really happy to help anyway that I can, and I hope people understand and can put themselves in those people’s shoes, and just know what it’s like to have everything taken away from you,” the “Hannah Montana” alum summed up. As Emmy Awards night nears, just know this: 35 actors across 11 categories are competing against a castmate -- or two -- from their own show. Perhaps a tad awkward, another danger lies in the trend: the possibility of same-show nominees cancelling each other out to make way for another winner. Scroll through to see the colleague battles in store for Emmy night on Sunday, Sept. 17. 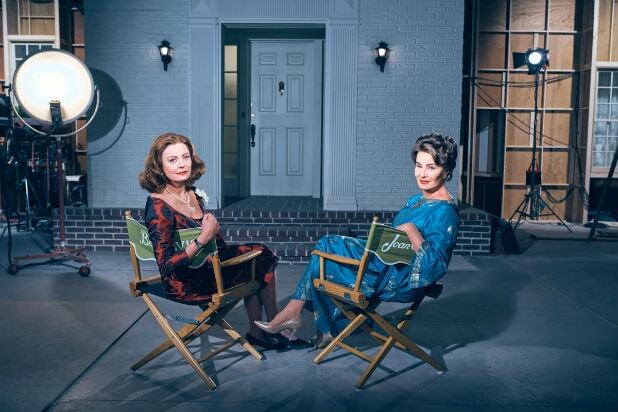 Jessica Lange and Susan Sarandon, "Feud: Bette and Joan"
The jam-packed Lead Actress in a Limited Series category will pit two "Feud" stars against one another, a serendipitously ironic nod to the showdown between Bette Davis and Joan Crawford, the women they portray on Ryan Murphy's FX series. Nicole Kidman and Reese Witherspoon, "Big Little Lies"
Nearly every actor in HBO's hit miniseries earned a nomination, with Witherspoon and Kidman both competing as leads. Laura Dern and Shailene Woodley, "Big Little Lies"
Dern and Woodley, the two "Big Little Lies" stars competing in the Supporting Actress category, will go up against actresses from FX's "Feud," ABC's "American Crime" and HBO's "Wizard of Lies." Sterling K. Brown and Milo Ventimiglia, "This Is Us"
Given the disjointed narrative structure of "This Is Us," the show's two lead actor contenders only shared the screen once, via hallucination. Denis O'Hare, Brian Tyree Henry and Gerald McRaney, "This Is Us"
Three actors from NBC's feel-good drama make up half of the category for Outstanding Guest Actor. And they're going up against last year's winner, Hank Azaria of Showtime's "Ray Donovan." Jane Fonda and Lily Tomlin, "Grace and Frankie"
Tomlin now has three consecutive nominations for Lead Actress in a Comedy for her work on the Netflix series. Now, this year, she's joined by her co-star Fonda. Riz Ahmed and Matthew Rhys, "Girls"
Lena Dunham's acclaimed HBO comedy went out this season without any major Emmy nominations, receiving just four nods including two for guest stars Ahmed and Rhys. John Turturro and Riz Ahmed, "The Night Of"
Ahmed is twice-competing against his co-stars this year, most notably against Turturro in the Lead Actor in a Limited Series category for HBO's summer crime drama. Bill Camp and Michael Kenneth Williams, "The Night Of"
The four acting nominations for "The Night Of" include supporting players, Camp and Williams, going head-to-head. Kristen Wiig and Melissa McCarthy, "Saturday Night Live"
NBC's sketch series had a huge season, thanks in large part to an unconventional year in politics. The show earned nine acting nods, including for returning cast member Wiig and recurring Sean Spicer impersonator McCarthy, both competing for a Guest Actress in a Comedy Series statuette. Vanessa Bayer, Leslie Jones and Kate McKinnon, "Saturday Night Live"
Three of "SNL's" regular players earned Supporting Actress in a Comedy Series nominations, including last year's winner Kate McKinnon. Dave Chappelle, Lin-Manuel Miranda and Tom Hanks, "Saturday Night Live"
A total of five "SNL" hosts this season scored nods for Best Actor in a Comedy Series, meaning nearly a fourth of Season 42's guests were recognized by Emmy voters. Kathryn Hahn and Judith Light, "Transparent"
This marks Light's second Supporting Actress in a Comedy nomination for her work on Jill Soloway's Amazon series, but this year she's nominated alongside Hahn instead of co-star Gaby Hoffman. Judy Davis and Jackie Hoffman, "Feud"
Ryan Murphy's dramatization of the Crawford-Davis rivalry earned six acting nods -- the most of any limited series -- pitting Davis and Hoffman against two "Big Little Lies" stars, Michelle Pfeiffer and two-time winner Regina King in the category of Supporting Actress in a Limited Series or Movie. Alfred Molina and Stanley Tucci, "Feud"
Though "Feud's" story mainly focuses on the women, Tucci and Molina also earned nominations for Supporting Actor in a Limited Series or Movie. Tony Hale and Matt Walsh, "Veep"
For the third year in a row, Hale and Walsh are both up for Supporting Actor in a Comedy Series -- an award Hale has taken home twice already.